The strong French Non-Farm Payrolls could not help EUR to grow due to several elections in France, Italy and Germany. 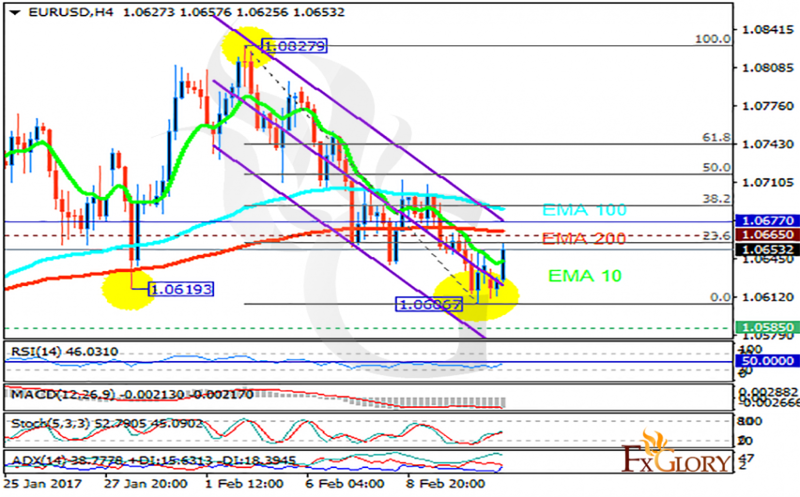 The support rests at 1.05850 with resistance at 1.06650 which both lines are below the weekly pivot point at 1.06770. The EMA of 10 is moving with bearish bias along the descendant channel and it is below the EMA of 100 and 200. The RSI is rising towards the 50 level area, the Stochastic is showing upward momentum and the MACD indicator is in negative territory. The ADX is showing a buy signal. EURUSD is creating a correction pattern after leaving the previous low at 1.0606 therefore it will rise towards the 50 level of Fibonacci retracement.